Nothing beats the look of inking something by hand. The variation of coverage and the small inconsistencies are what give it that individual look. The problem comes when you want to scan that work in and use it. Unless you have an expensive scanner, your work may lose that tone and end up being a bit flat. 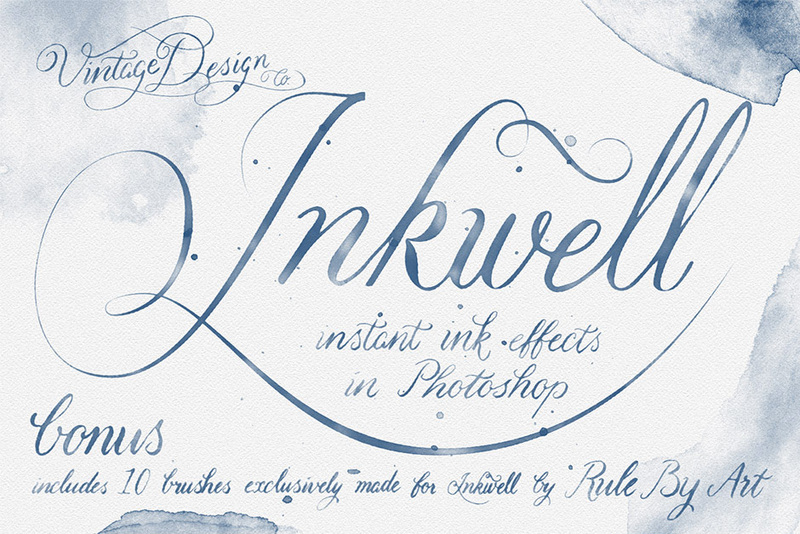 Inkwell recreates the look of hand drawn Ink in Photoshop, so you can give life back to your lettering and illustration work. Inkwell uses Photoshop smart layers. Just double click on the layer, paste in your work, save, close and you’re done. 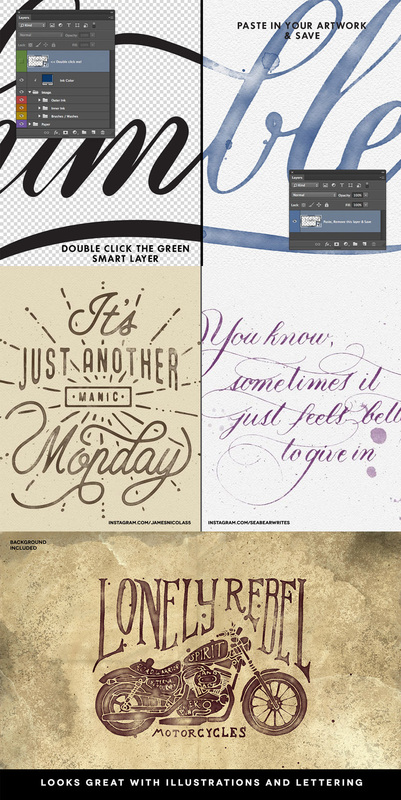 This works great with calligraphy, hand lettering, illustration and even fonts. The download also features hand made India Ink brushes and washes (made by RuleByArt) to add even more depth to your work. Check out the video demo to see how easy it is to use. Software requirements: Adobe Photoshop CS3 and newer. File size is approx 155.1MB (235.5 MB unzipped), offered as a single download. I am really sorry to be the bearer of bad news but I’m afraid this item is only compatible with Photoshop so it will not work for you in Illustrator. My sincerest apologies for any disappointment caused. I am interested in finding out if this can be used in Illustrator. Please email it. Thanks! Can the transparent background be kept? The first image shows a before image with a transparent background. After the effect is applied there is a white background behind the new text design. Is it possible to remove that white background and keep the transparent background with the new text design after it is applied? Thank you. I hope this helps, Tony, and please don’t hesitate to contact me should you have any other questions. I’m here to help! Three in a row! Sorry about asking for the instructions for Illustrator too, could you please email it. Big thanks and a bigger happy birthday. Thank you so much for getting in touch and thank you for your purchase! I’m really sorry but I’m afraid that this item is only available in Photoshop – I apologise for any confusion caused! Rest assured, I can certainly offer you some alternative resources that will definitely work for you in Illustrator! I’ve sent you an email to assist with this. Apologies again for any confusion, Alejandra! Please don’t hesitate to contact me should you have any other questions. I’m here to help! Hey Carol, I am also interested in finding out if this can be used in Illustrator. Please email me too! Thanks so much for getting in touch! I have just sent you an email to assist you with this 🙂 I hope it helps, and please don’t hesitate to contact me should you have any other questions. I’m always happy to help!